Rich Acoustic Music, Original and Traditional, based in the Celtic style. 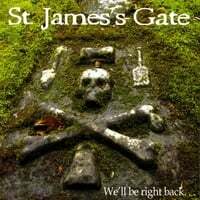 St. James's Gate is one of the Northwest's most popular and exciting Irish bands, though their sound ranges across many traditions and styles, including original, traditional, and cover songs. "We'll Be Right Back" is the band's third CD release, and first true "studio album," having been produced almost entirely in the Bear's Den Studio over the last four years. The tracks represent the many facets of this intriguing group, from haunting lonely air to rollicking jigs & reels to new takes on old classic songs.